AMBER LOVE 21-AUG-2017 The FARRAH WETHERS MYSTERIES are available through sites like Amazon and Barnes & Noble. Please go to patreon.com/amberunmasked to sponsor the show, the site, and my work. Don’t forget to read through the Adventures with Gus blogs about life with my cats at The Winchester-Nabu Detective Agency. Back on the show – it’s been four long years – is writer BRAD ABRAHAM to discuss his debut novel, MAGICIANS IMPOSSIBLE (launching September 12, 2017). 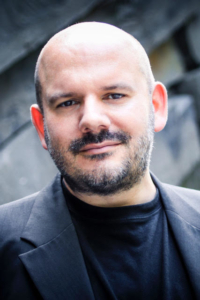 Protagonist Jason Bishop spent his life resenting his father and had mixed feelings upon the news of his death. He believed dear old dad was a deadbeat who would rather take off for parts unknown on his mysterious job than to ever spend time being a single parent. Instead, Jason is raised by an aunt and uncle. When it came to magic, he thought it was a bunch of tricks performed for audiences, but never considered it to be real. Brad shared not only the backstory of where the ideas came from for MAGICIANS IMPOSSIBLE, but also the story on how it came to be published on spec. 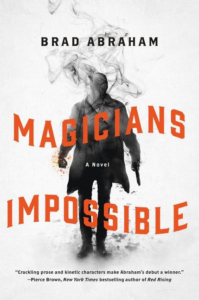 The original draft of MAGICIANS IMPOSSIBLE was set in pre-WWI with illusionists working for the Secret Service. The publishing experience depended on Brad’s former agent remembering his pitch which he personally passed on and then told another person who was looking for Harry Potter mixed with James Bond. It was rewritten to be modern day and have different approaches to the magical powers. There’s so much family drama and friendship drama in this story. Every connection to Jason is tested and he keeps going. Starting a family has been a huge impact on Brad’s life and even his writing routine. His son was born during the writing of MAGICIANS IMPOSSIBLE and Brad feels he can pinpoint what page it happened because his writing changed. Then came days and nights of feeding on a schedule and getting away from his desk in order to raise his son. As Jason discovers that this world of magic exists, Brad was discovering this new life as a parent. Jason learns about magic from The Invisible Hand, the agency of trained natural-born mages. He’s led to believe that people who are mundane but learn magic through studying arcane knowledge are evil. They are based on the real Hermetic Order of the Golden Dawn. As far as that routine change, Brad used to write every single day for about a year and then burnt out (working for TV). MAGICIANS IMPOSSIBLE is primarily set around New York but there are hops and jumps to other cities for brief moments. Brad had personal experience around Paris, but only spent one day in the real Cold Spring, New York. If you love the qualities of friendship seen in Stand By Me, you’ll love those flashback portions of Jason’s life in Cold Spring. So we need to get you or the fans to enter all those locations into Squirl. It’s an app that’s only on iOS for now. I hope they expand so I can use it. But you can enter locations of books through the desktop dashboard no matter what browser you have. Vodka O’Clock gets the scoop: Brad reveals that MIXTAPEListen to VOC1336, his comic series, is in development for television. He warns about the early excitement of content being optioned for TV or film and how they often go nowhere or not how fans would expect. So far, the people involved are meshing with Brad’s vision. He’s been commissioned to write the series bible and the pilot script. Protected: For WWAC: Is there a new social media on the horizon that really is a safe space? Catching up after yoga training. Books and writing stuff.